I just read that starting on January 1st, 2014, it will now be illegal to talk on the phone while driving in the state of Illinois. This will be the 12th state to enforce this law in the country. Already there is a ban on texting and talking while in a school zone so this new law will extend to talking at any time while driving. The only exception is if you are using a hands free device. While I agree that texting should be illegal, I don't think talking on a cell phone should be illegal and I'll explain why. Texting requires you to take your eyes off the road to look at your phone to either type or read a message. Anything can happen in a split second with your eyes off the road. A car could jam on its brakes. A kid could run out into the street. When you are looking down at your phone, you have no way to know what is going on ahead of you. Not only does texting take your eyes off the road, but it makes you change your focus from looking far ahead to close up. This visual focus adjustment takes time itself. So why should talking on the phone be legal? Talking is a distraction, but so are a lot of other things in a car that are still legal. Talking to other people in the car can be a distraction. Playing with the radio or trying to eat something while driving can be a distraction. 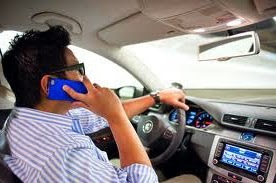 Even though talking on the phone does take some of your focus away from the road, you can still see what is going on and react by steering with your free hand. Yes, having 2 hands on the wheel gives you more control, but many people do not use 2 hands on the wheel even when they are not on the phone. So what will be next, making it illegal to take a hand off the steering wheel? They say you will be able to talk on the phone as long as you are using a hands free device. I don't think the safety issue here is about if you are holding a phone or not. The distraction of talking with someone is the same whether is it on a hands free device, or the phone itself. So starting in 2014 we will no longer be allowed to talk on the phone while driving or else risk getting a ticket. I think some people will still do it because it is hard to ignore a call when your phone is ringing and no one is going to want to pull over and stop their car to answer or make a call. What are your thoughts on this issue? Should people be able to talk on their phone while driving?